All of his career, Darren Fittler has been bending people’s conceptions of the world. Then he has shattered them. On first encounter over the phone or electronically, the Gilbert + Tobin lawyer strikes most as a talented but profoundly ordinary lawyer. That impression has much to do with the unremarkable way he does his job. He returns client emails promptly and has the analytical skills to comb through documents as quickly as the best lawyers. It is only when clients meet Fittler in person that they realise what sets him apart. Fittler, despite all the tasks he can perform, is blind. Even more remarkable is what he does outside of practice. 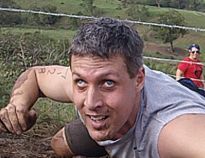 Drawing parallels with the Marvel character Daredevil – blind lawyer by day, death-defying superhero by night – Fittler has become the first blind person in the world to compete in an array of high-octane, adrenaline-heavy obstacle courses. The difference is that Fittler’s story is no comic book fantasy. The lawyer’s path from teen struggling with impending blindness to rainmaker in one of Australia’s most prominent firms is as inspiring as it is heart-breaking. “I grew up in a country town just west of Coffs Harbour. I was diagnosed with my condition at age five and began gradually losing my sight. By the time I was 13 and heading into a mainstream high school, it had mostly gone,” Fittler says. He adds that growing up as the only blind student at a school of more than 1,000 pupils was a hardening experience. Frequently bullied and unable to access a lot of the same learning materials as other students, his high-school experience was more challenging than most. After finishing high school, Fittler went to university with the intention of doing a combined degree in law and social work but ended up studying only for the social work degree. He finished this in 1996 and, after a stint travelling, was employed as a social worker. A few years later he decided to set his mind to studying law again and resolved to graduate in law as soon as possible. After two years of summer school and intensive courses, he eventually became qualified as a lawyer, joining Gilbert + Tobin in 2004. At first he was rotated around the firm, gaining experience in a number of corporate practice areas. This was followed by a few years in the firm’s pro bono team, which inspired Fittler to eventually move to Gilbert + Tobin’s department specialising in charity law, which he now leads. Motivated to hit the gym, Fittler hired a personal trainer, and what started out as once-a-week sessions eventually evolved into three-times-a-week workouts. He tried CrossFit training for a while and a range of other exercise programs until an idea struck him. Following the success of his Tough Mudder experience, Fittler has since entered other obstacle course races, including the Spartan Race, which he claims is a lot more gruelling because, unlike Tough Mudder, it is timed and participants face penalties for failing at obstacles. Fittler says that, like any marriage, his requires a certain amount of give and take, but the challenges are compounded by his disability. His advice to other people who feel they are facing insurmountable obstacles is to never underestimate what can be achieved in the long term. It is this thinking that has helped him gain the confidence to compete in gruelling physical challenges and, more importantly, compete on an equal footing with other lawyers.